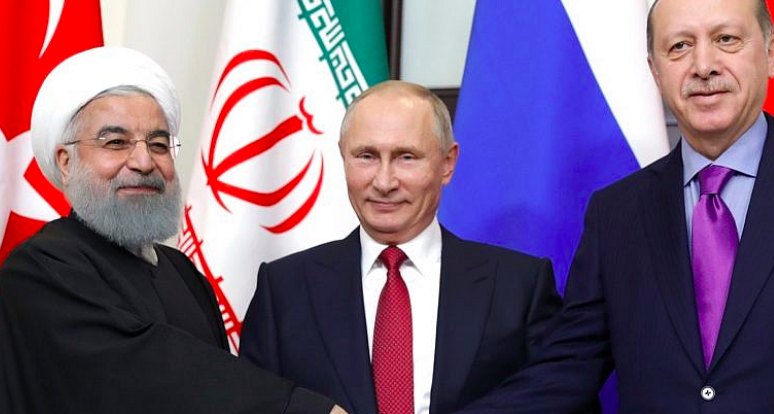 Pictured Above: From left: Iranian President Hassan Rouhani, Turkish President Recep Tayyip Erdoğan and Russian President Vladimir Putin in Ankara. Credit: Wikimedia Commons. (JNS) Russia says that Iranian forces will withdraw to at least 85 kilometers (53 miles) of Israel’s border, according to an interview with Russia’s chief Syria on the Sputnik news site. Israeli Prime Minister Benjamin Netanyahu has flown multiple times to Moscow to meet with Russian President Vladimir Putin to urge the leader to put an end to the presence of Iranian troops in Syria altogether, and met just last week with Russian Foreign Minister Sergey Lavrov in Jerusalem. Following that meeting, Israel rejected a Russian proposal to keep Iranian forces in Syria 100 kilometers (62 miles) away from Israel’s northern border, according to a senior Israeli official. Israel is maintaining its demand that Iranian military presence be removed from the country and that all long-range missiles be removed from Syria, with factories that produce them being shut down.